Members of the Ohio Supercomputer Center, seen here at the OH-TECH booth at SC15, have been attending the SC Conference since its inception in 1988. Every profession has a big stage, whether it’s the Oscars, ComicCon or the Super Bowl. For those of us who live, breathe and love high performance computing and supercomputing, the SC Conference is that big stage, the highlight event of the year, and it happens next week – Nov. 13-18 in Salt Lake City. The SC Conference is a major gathering of a who’s who in the HPC community, offering attendees so many incredible learning, networking and information opportunities we simply don’t get elsewhere. With approximately 5,000 people participating in the technical programs and 11,000 people attending SC overall, it’s easy to see why this conference is the perfect gathering spot for those of us in the HPC community, which includes scientists, engineers, researchers, educators, programmers, system administrators and developers from all over the globe. The SC conference offers fantastic relationship-building with peers, funding organizations and vendors. The SC Conference series regularly allows OSC staff members a potent and unique venue for HPC training and education, which is beneficial on many levels. The Technical Program is the highlight of the conference, providing many avenues for sharing research, development and applications in HPC, networking, storage and analysis, according to the SC website. This year, some of the highly anticipated workshops include “Computational Approaches to Cancer,” “Women in HPC: Diversifying the HPC Community” and the “Seventh Annual Workshop for Energy Efficient HPC Working Group,” among others. There is no other venue where OSC staff members can place the center’s achievements, offerings and expertise in front of the entire HPC industry. OSC’s visibility in the national HPC industry — accentuated by its presence and involvement at the SC conferences — has aided in OSC’s inclusion in several national-level collaborations, programs and partnerships, such as NDEMC, DOE HPC4Mfg, NSF XSEDE, US Ignite and the Alliance for High Performance Digital Manufacturing, to name a few. At SC16, 351 organizations are listed as exhibitors, including Dell, Intel, IBM and the Department of Energy. Of those organizations, 125 are research organizations, which include the San Diego Supercomputer Center, the Pittsburgh Supercomputer Center and, of course, OSC at booth 1107. The exhibition hall features the latest technologies and accomplishments from the world’s leading vendors, research organizations and universities. SC16 will be the very first opportunity to learn about many of the technologies that will shape the future of large-scale technical computing and data-driven science. The visibility throughout the HPC community also includes the HPC trade media, with outlets such as HPC Today, HPCwire, Business Wire and a slew of others. A year ago, conference attendance led directly to a later inquiry, interview and article in Desktop Engineering magazine. Earlier conferences led to one-on-one relationships and a higher frequency of story placements with editors from outlets such as HPCwire and SupercomputingOnline. In 2004, an OSC executive delivered a speech in which he coined the term “blue collar computing,” a concept that today is used throughout the field to describe the use of supercomputing in industry, beyond the walls of university research. The SC conferences provide organizations such as OSC with an unparalleled opportunity to meet with a wide range of vendor representatives, especially with key officers that aren’t generally available the rest of the year. This interaction is particularly valuable, both for informing upcoming purchases of goods and services and for nurturing longer-term relationships. In years past, OSC often contributed staff time toward committee roles at the conference. This participation has yielded some additional opportunity to build relationships among the center’s peers in past trips to SC. As we trek to Salt Lake City for the upcoming conference, be sure to follow us for all the sights and insight on our social media channels from Facebook to Twitter to LinkedIn and Instagram at @oh_tech. The Ohio Technology Consortium delivers world-class technologies, information and expertise to benefit academic, government and industrial researchers and boost Ohio's economy. OH-TECH is comprised of five member organizations: the Ohio Supercomputer Center (OSC), the Ohio Academic Resources Network (OARnet), Ohio Library and Information Network (OhioLINK), eStudent Services, and the still-in-development Research and Innovation Center. We hope to become your resource for news and information on supercomputing, networking, library trends, and e-learning. 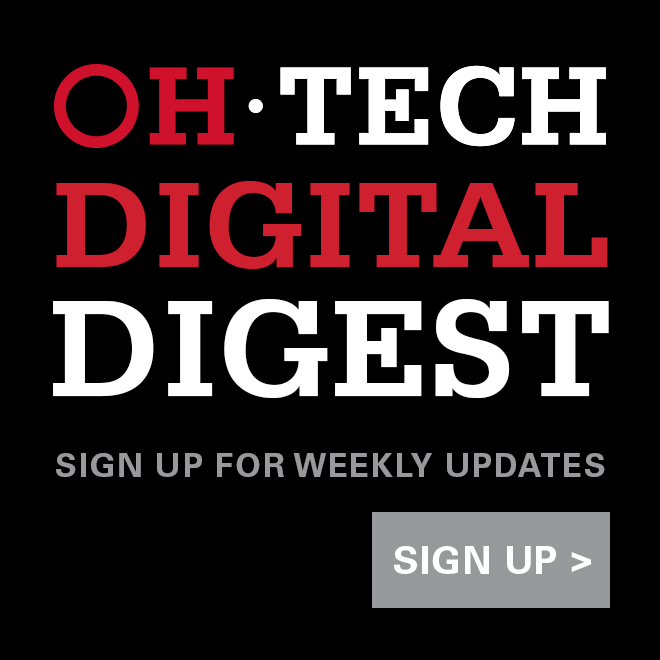 The views expressed on this web page are those of the author/s and do not necessarily represent the positions of, and should not be attributed without confirmation to, any OH-TECH member organization, the Ohio Technology Consortium, The Ohio State University or the Ohio Board of Regents.